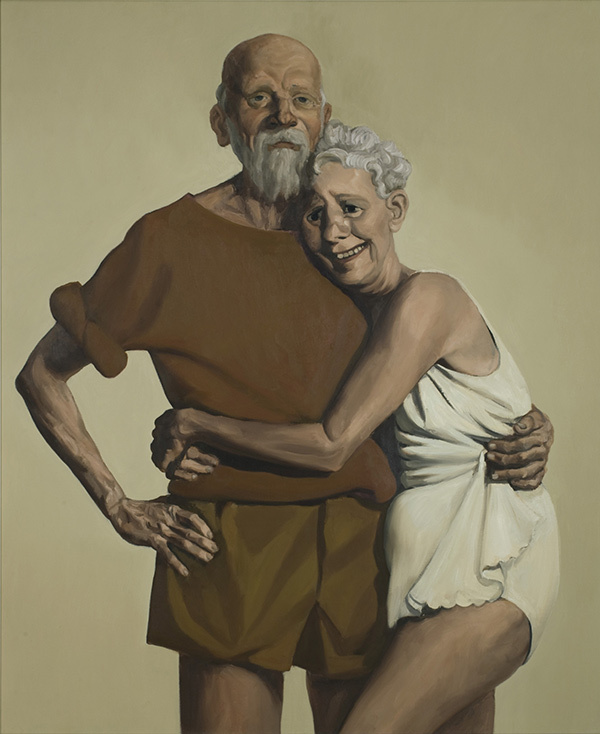 I always linger on the old man’s sweater in Old Couple, painted in 1993 by John Currin. It’s thick, probably of wool, and the old timer must have a substantial frame to keep that sloping, round collar from slipping down his front. It’s what I would call a fisherman’s sweater, perhaps of the Aran variety. Paired with the man’s trunks, I get the impression that this old man is on the coast somewhere, perhaps even on an island. He has that faraway stare, that horizon-beholding firm chin of someone at the helm or someone at sunset. 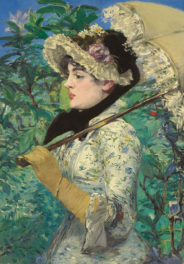 The man’s wife also has an informal, coastal look in that short white dress. They could be vacationing in Nantucket; they could be in Dover atop one of the white cliffs; they could be in Sicily among olive trees at the edge of the Mediterranean. They could be on any ocean ledge, even on the Greek island of Ithaca. When walking through the Getty Center, on a mission to find sympathies between this Currin work and classical painting, I fell on Jacques-Louis David’s The Farewell of Telemachus and Eucharis painted in 1818, a late David work which, at least at first, rhymes visually with Old Couple. The nymph Eucharis is wrapped around Telemachus with the same clasped hands, with a look of resignation similar to the old woman’s. Telemachus has the old man’s same faraway look. 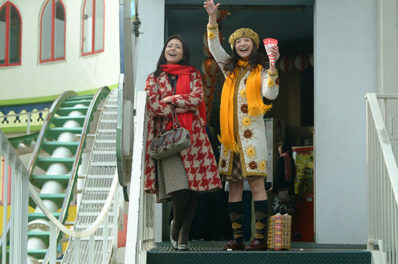 As the old man may be leaving soon in death (why else would the background be so moody and the old woman so hysteric? ), so too is Telemachus leaving Ogygia, Calypso’s island. As the old man looks to the sea, Telemachus looks for his father, Odysseus, who has been nothing but a rumor since he left the ruined city of Troy to head home. Telemachus has received news of Odysseus on Ogygia, for Odysseus was once detained by the nymphs as well. For both the Telemachus and the old man, it is time to go. The Farewell of Telemachus and Eucharis is much more famous than its source, the book Les Aventures de Télémaque by one Fénelon, long out of print and virtually unknown outside of what must be a very small crowd of fans of obscure late 17th– and early 18th-century French moral literature. The book was apparently a lesson in duty and chastity as well as a fantasia on Homer’s Odyssey, using its characters and locales but working the story to different ends. 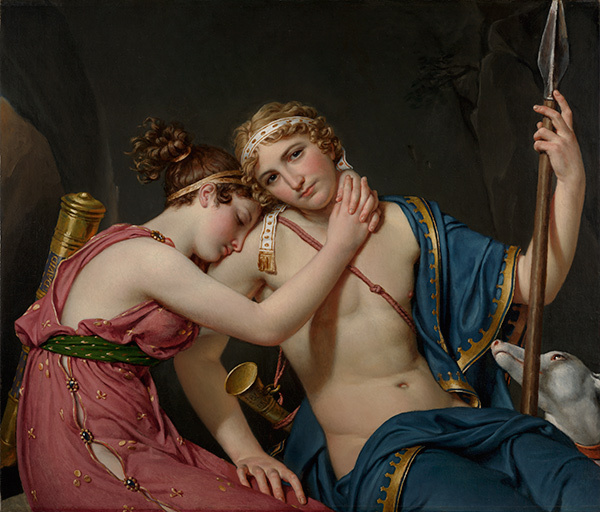 The relationship of Telemachus and Eucharis, in Fénelon’s telling, was a chaste one, a relationship that ended due to the more powerful pull of Telemachus’s duty to his family. Fidelity to Odysseus and his mother Penelope proved more powerful than love or lust. Jacques-Louis David obviously has his doubts about the whole “chastity” part of the story. 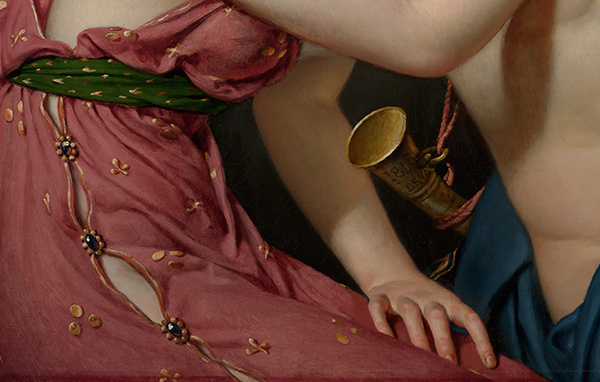 David’s Telemachus has a complicated look, showing resolution as well as betraying a certain satisfaction (all he need is the post-coital cigarette). Say what you will about modeling classical marbles and looking to Greek tradition, but David certainly lets Telemachus’s robe wander down a bit far. His hand is on Eucharis’s thigh as though he’s been there before and knows the lay of the land. The little dog (Fidelity) looks on, but at this moment, Telemachus seems like he would be happy to get around to Odysseus tomorrow. One more second, one more minute, sure, why not, he could at least have one more lunch with Eucharis. Don’t get me started on the particular position of his (very erect) spear. What is interesting in comparing Old Couple by Currin to The Farewell of Telemachus and Eucharis is that it is citizen David, son of the French Revolution and master of canvases illustrating the moral dilemmas of contemporary France through the lens of Neoclassicism, who gets around to more sexual hijinks in his work than Currin, who is quite infamous for overt sexual content. Like Currin does with his use of classical painting technique, mining its form to send up our moral pieties, so David does in The Farewell of Telemachus and Eucharis. 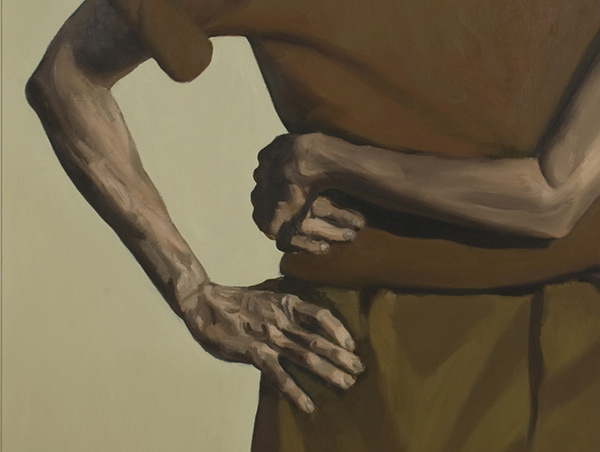 While Currin mixes Jusepe de Ribera’s take on old skin (as in his many renditions of St. Jerome) with Edouard Manet’s neutral background, so David drapes the whitewashed skin of weathered Greek sculpture in the light of Caravaggio. It’s fun to note another strange twist: David was 70 years old when he painted his work, a dream of youthful insouciance, while Currin was only 32 when he painted his vision of the old couple. If we tangle the ideas of looking forward and looking back, the sympathies between the two paintings deepen even further. 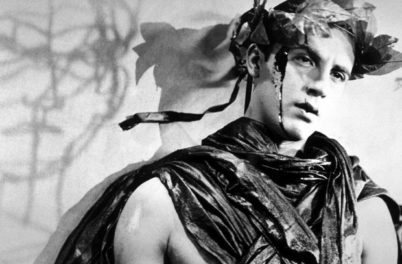 Is there more than satisfaction in Telemachus’s glare? Sure, he looks to the sea, he looks to duty, but he also wears the glint of his father’s eye. He, like Odysseus, is locked in a conflict between further adventure and a longing for hearth and home, between the embrace of the nymph and the wishes of Penelope. We know what the nymph looks like, but what does that other image look like, the image compelling Telemachus’s sense of duty? Is it the projected image of his unknown father? I assume that the context for such an image would not be Troy or Ogygia, but probably Ithaca. And considering Telemachus’ duty is not to just to Odysseus but to Penelope as well, would not the image be of both of them? It is a fascinating little fantasy, a fantasy less and less farfetched if you really think about it, to see the image compelling Telemachus’ currently lackadaisical duty as Currin’s projection of the Old Couple, that couple on the beach, the old man looking out at sea as if longing for future adventures and remembering old ones, the old woman grasping the old man as if she had once almost lost him. And how about one more step? Wouldn’t the David painting be an easy image for Odysseus to conjure when thinking of his own past, his face mirrored only by his son in an age without photographs, both men loyal to Penelope, both men sharing the memory of Calypso’s nymphs? John Currin and Getty President and CEO James Cuno talk at the Getty Center on September 14 at 3:00 p.m. A co-presentation of the Getty Museum’s Getty Perspectives series and The Broad’s Un-Private Collection series, the conversation will look at Currin’s works in The Broad collections and Old Master European paintings and drawings in the Getty collections. The talk is sold out, but a standby line will be available onsite and the talk will be live streamed at thebroad.org. Text of this post © Ed Schad. All rights reserved. I'm an arts writer and assistant curator at The Broad.